Mark Kranenburg is a builder of quality, custom, eco-responsible and creative homes in the Ottawa region and he says there is no way to stop noise from entering or escaping a home. That’s the bad news. The good news is that noise can be reduced. 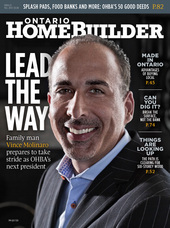 Kranenburg is the 32-year-old president of Greenmark Builders, who started as an apprentice carpenter at age 18 and worked his way up to managing home builds for a custom builder at age 23 before forming his own company in 2010. He says there are many ways to quieten, muffle or partially soundproof a home, from using sound-absorbing materials to implementing creative construction methods that can soften a home’s acoustics. And he agrees that one of the goals of a house builder, architect or interior designer should be to initially create a home that’s quiet, and not go into a finished structure and then start to think of reducing noise. Kranenburg says sound bounces easily off ceilings “and there’s nothing worse than a large square box ceiling.” He is partial to inverted or recessed tray ceilings. Billed as one of the top sound-proofing solutions in the world by its maker, Saint-Gobain Performance Plastics of Granville, NY, Green Glue (distributed in Canada by OHBA member Morin Bros. Building Supplies Inc. of Ottawa, among others) is a viscoelastic compound and sealant that can be quickly and easily applied between two sheets of drywall, plywood or any commonly used building material. Studies have shown that it effectively eliminates up to 90% of noise transfer from one room to another. A certified Insulating Concrete Forms (ICF) builder, Kranenburg says an ICF home is the quietest because there is no bond break. “There’s no place for sound to penetrate, so outside noises are eliminated,” he says. Some ICF builders say that in the past four years these forms, or moulds—which have built-in insulation for accepting reinforced oncrete—are fast becoming the mainstream preferred building product worldwide. But Kranenburg doesn’t see a widespread acceptance in Canada for ICF homes to date, despite the comfort (nothing blows through reinforced concrete), the flexibility in design, energy efficiency and resulting quietness. When Josie Abate of Woodbridge founded Ambience Design Group in 1987, the objective for her and her design team was to analyze their clients’ goals, transform those goals into reality and give the client peace of mind along the way. That raison d’être is still her company’s philosophy, and the part about “peace of mind” is ever more important in our increasingly modern (and noisy) world. “Certain materials used in the construction of the home can add to the intensity of the noise,” Abate continues. “Hard, stone floor surfaces can be the worst offenders, especially when people do not remove their shoes.” She adds that wooden floors are very much in vogue because it’s a natural material and not as noisy as a stone floor. While wood isn’t exactly a sound-muffler, hardwood-style cork flooring is great for sound absorption. Abate also says leather floors are in fashion, particularly buffalo leather since it is durable and thick. Whatever the flooring, she often suggests that clients place area rugs in some large rooms, adding that some patterns are very beautiful and give a room a contemporary look. It has long been known that carpets soak up the sound, and thicker rugs are more effective at reducing noises that bounce off hard surfaces. Rugs and carpets can also be coupled with sound-absorbing padding. Abate concurs with the unwritten rule that 25% of a room should have some kind of absorbing material, even if it means decorating with fabric furniture rather than leather. Paul M. J. Suchecki, in an article titled “Quiet Your Home,” writes that we can take lessons from the change in sound when furniture is placed in a room. “By putting in couches, chairs and rugs in an otherwise empty room, you’ve added acoustical dampening,” Suchecki notes. Abate recommends sound-deadening drapes in a living room, especially if the room has an open, high ceiling that makes noise echo. Some experts suggest that heavy drape materials such as velvets and wools are best for sound absorption and if there’s a mass-loaded vinyl layer, even better. A recent breakthrough in sound-absorbing draperies came from EMPA (an interdisciplinary research and services institution for material sciences and technology development with two locations in Switzerland) and a Swiss textile designer, Annette Douglas, who created a gauzy material that allows some natural light but absorbs sound, thanks to its modified polyester design. Whether you are a builder, interior designer or architect, it’s important to remember that a home is a person’s sanctuary, and as such, should be designed and built as a peaceful place. If you listen closely to your clients’ wishes for a quieter home, the result will be good for their hearing and health…not to mention your bottom line. Install Acoustic panels: Coming in a range of colours and fabrics, 1-inch-thick acoustic panels are easy to install and work with almost any decor. Hang Sound-Absorbing Art: Artwork printed on fabric, tapestries and canvas photos absorb sound. Cork or Concrete Flooring: Concrete and cork are among the best materials for sound absorption. Furnishings: Plush, upholstered furniture accessorized with soft pillows and throws. Carpets, Rugs and Padding: Cut-pile carpeting tests better for absorbing sound than loop pile carpeting. Foam rubber backing also helps to absorb sound. Floating Hardwood: This type of flooring installation includes a gap between the subfloor and the actual floors which effectively diminishes sound. Draperies: Fabric window coverings and curtains absorb and block sound. The heavier the fabric, the better. Triple-Pane Windows: Offer a large reduction in noise from single- and double-pane windows. Solid Wood Core Doors: The heavy mass of solid doors will dampen sounds. Reduce the Number of Hard Surfaces: Use upholstered ottomans for sofa tables instead of glass or metal. No Pocket Doors: They create a wall cavity that can’t be insulated.